The task of creating Montecristo Epic was assigned to a special team of our most skilled and accomplished cigar makers – our Grupo de Maestros. These artisans, with centuries of combined experience and love of the craft, were brought together to create a true masterpiece the Montecristo Epic. Every step of the process is performed with meticulous attention to detail and obsessive devotion. Each super-premium Montecristo Epic is made with the finest aged tobaccos and carefully hand-inspected to ensure quality. Every beautiful box includes a certificate of authenticity signed by the artisan at every key step during the making of this exquisite cigar. 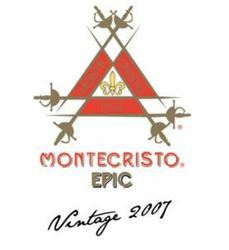 True to its name, the Epic is fuller-bodied than other Montecristos and provides a robust blend of complex flavors. One draw elicits wonderfully rich notes of chocolate, nuts, coffee, fruit, and caramel. The smoke is wonderfully round and aromatic. This is a cigar so special, so unique, so select, it needs to be experienced. It's Epic.